While many of you out there are currently working on your christmas card #50 or so, I've just managed to make my first one for this year. 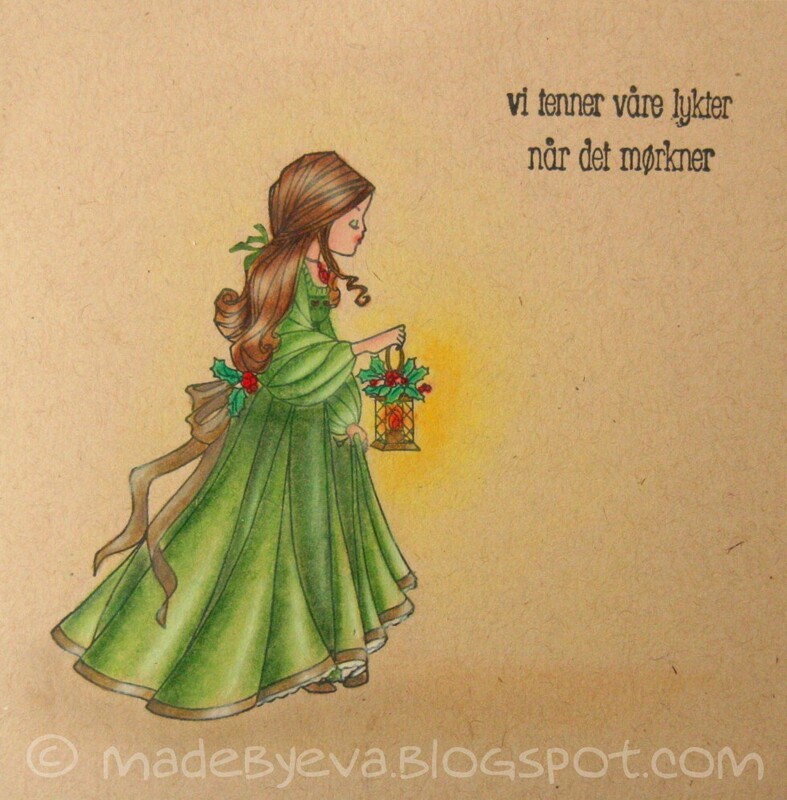 I made this the same day as my previous card and as "Willow with lantern" is my absolute favourite stamp designed for colouring, the choice was easy. The sentiment is a line from a beautiful Norwegian christmas song and is hard to translate in any beautiful way, but basically it says "we light our lanterns when darkness falls". Suggestions for a more poetic translation are very welcome. I've used my Prisma pencils of course, and added some shine with shimmering chalks. The chalk is not very visible in the picture, but adds a subtle glow around the lantern and Willow's upper body. The single layer look is tempting, but I still feel like I haven't quite got it right yet... Although I have no idea of what to do different. Oh well, maybe it just takes some getting used to? It certainly is a change from my usual stuff! I think this just might be the theme for this year's christmas cards.